Please click the above, I promise you won’t be sorry. When upon arriving to the site, I was just hoping to look for a great shoe or a new quilt for my bed. Little did I know that I would see one of the cutest and most innovative flash videos. It first asks you “Where are you headed?” and you have a choice between the Boot Hill, Necklace Valley, Clutch Creek, Bracelet Park, Ring Peak, or Belt Bridge. Then it takes you to a through a little miniature set up of a village. Each little “trip” includes their products as part of the landscape with little tiny people included in the setting. It is an amazing use of their products and was highly creative. A lot of times, clothing company lack innovation when it comes to displaying their products in new and interesting ways. Anthropologie almost always has great window displays, direct mail pieces, and this little animation tops it off. Hats off to you, Anthropologie, for always being ahead of the game. 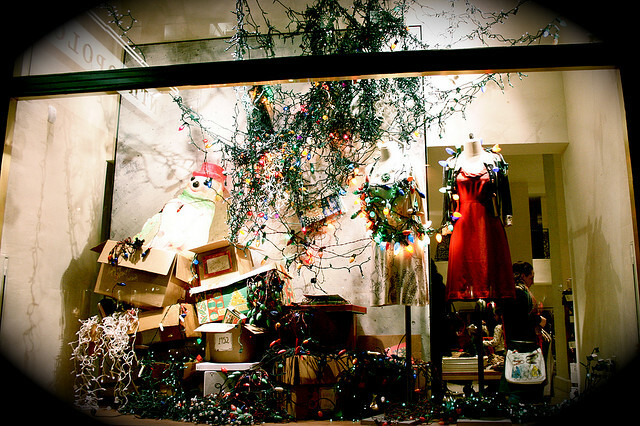 Here is an example of one of their window displays.